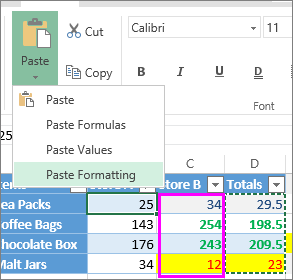 There are two ways to paste specific cell contents or attributes like a formula, format, or comment copied from another cell. 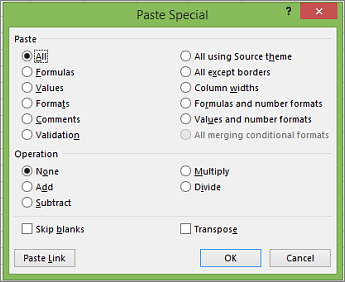 You can either pick a specific paste option directly from the Paste menu or click Paste Special, and pick an option from the Paste Special box. Select the cell with the attribute you want to copy and press Ctrl+C. Tip: To copy a selection to a different worksheet or workbook, click another worksheet tab or switch to another workbook. Click the upper-left cell of the paste area and use either the Paste options or the Paste Special options. Copied cell content along with its column width. Reorients the content of copied cells when pasting. Data in rows is pasted into columns and vice versa. Values and formatting from copied cells. Reference to the source cells instead of the copied cell contents. Copied image with a link to the original cells (if you make any changes to the original cells those changes are reflected in the pasted image). To use options from the Paste Special box, click Home > Paste > Paste Special. In the Paste Special box, pick the attribute you want to paste. Note: Depending on the type of data you copied and the Paste option you picked, some other options might be grayed out. All cell contents and formatting. Only comments attached to the cell. Only the data validation settings from the copied cells. Only the formatting from copied cells. Values (visible results of formulas and not the formulas). Only the formulas from copied cells. Formulas and number formats in Paste Special. Only formulas and number formats (not text formats) from copied cells. Values and number formats in Paste Special. Only the values (not formulas) and number formats from copied cells. All except borders in Paste Special. All copied cell contents except borders. All using Source theme in Paste Special. Cell content with the formatting from copied cells. For more about copying an entire worksheet to another location in the same workbook or to a different workbook, see Move or copy worksheets or worksheet data. Tip: If you aren’t able to copy or paste, click Edit Workbook > Edit in Excel Online. 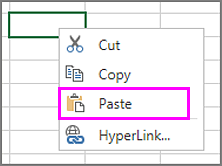 To paste copied cell contents, click the cell you want to paste into and click Paste > Paste or click Ctrl+V. Tip: You can also paste by right-clicking the cell you want to paste into and picking Paste. Click the cell where you want to paste the value you copied. Click Paste and pick Paste Formulas. Update absolute and relative references. For example, in this picture the pasted formula in cell F2 needs to be changed manually to=Average(C2,D2). Tip: For a range of cells, you’ll need to change the reference only in the first cell. Excel Online automatically updates the rest. 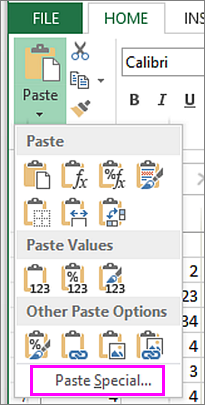 When you‘ve copied data from calculated cells, and want to only paste the values without the formulas, click the cell where you want to paste the values, and then click Paste > Paste values. Sometimes you want to reuse formatting in cells containing other data. For example, in this picture, the formatting from cells in the Totals column is pasted into the highlighted column. Select the cell or cell range that has the formatting you want to copy and press Ctrl+C. 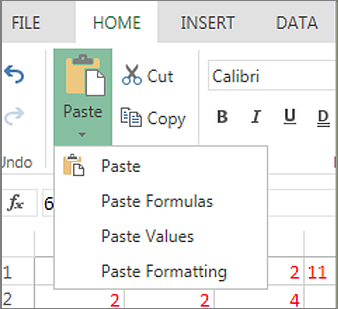 Select the cells where you want to paste the formatting, and click Paste > Paste Formatting.